How does one define "underrated"? I chose to define it as "games published in 2012 or before that are not in the BGG top 500." Thus, the list includes games that aren't highly ranked but have been out long enough to theoretically accrue enough votes to get such a high ranking. My feeling is that most of the games on this list are here because of lack of hype. Either these games weren't hyped as much as they should have been, they didn't get released as widely as they should have, or some other issue caused the game to get negative attention that resulted in some non-representative votes. I highly recommend all of the games on this list, as well as my "honorable mention," Android, which is a game I dearly love but just can't quite recommend to a broad audience because of the game length and heavy storytelling nature of the game. As always, this list reflects my opinion, not the opinion of the BGG hive mind. Coup: City State is a game for two to six players, designed by Rikki Tahta, published by La Mame Games and Indie Boards and Cards, and playable in about twenty minutes. Coup is a wonderful bluffing game in which players have two face down cards and can essentially claim that those cards are whatever they want, activating card abilities regardless of whether they actually have the card or not. If they get called on it, the penalty is stiff if they're bluffing... and stiff on the caller if they're not. 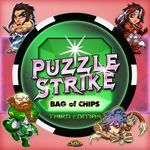 Puzzle Strike (Third Edition) is a deckbuilding game for two to four players, designed by David Sirlin and published by Sirlin Games, and playable in about forty five minutes. Puzzle Strike takes the basic deckbuilding format - a weak starting deck, a pool of upgrades to buy from - and amps it up by giving each player a unique character (three of their starting ten "cards" are the same) and adding a healthy helping of direct player interaction. Sleuth is a deduction game for three to seven players, designed by Sid Sackson and published currently by Eagle Games, and playable in about an hour. Sleuth is basically Clue with the needless board removed - there's no roll-and-move in this game. Instead, you have a set of four clue cards in front of you and, on your turn, you can play one of them targeting another player. That player must tell you - or, in some cases show you - the matching cards in their hand. Eventually you're able to deduce the one card that's been removed from the deck by process of elimination. BattleCON: War of Indines is a fighting simulation game for two players, designed by Brad Talton and published by Level 99 Games, and playable in about twenty minutes. In BattleCON, players choose a unique fighter, which gives them a character token and a unique set of cards, and combine that with a standard set of abilities. During each round, players choose two cards from their hand and place them face down, revealing both simultaneously to form a unique move. That move involves moving your character and executing an attack. The many unique characters plus the strong game system make this one a real winner. 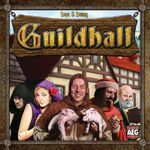 Guildhall is a set collection card game for two to four players, designed by Hope Hwang and published by AEG, and is playable in about forty five minutes. In Guildhall, you're attempting to organize professionals in a town into guilds - and do it faster than the other players. Each card depicts a profession (with a matching special ability) and a color - your goal is to complete sets of professions with each of the different colors, which will then score you points. On your turn, you can play two cards to the table and activate their abilities, then add them to your guild hall. When you complete a guild, you can swap that complete guild for a victory point card from the tableau. It plays fast and affords a lot of interesting combos. Copycat is a deckbuilding and worker placement hybrid for two to four players, designed by Friedemann Friese and published by Rio Grande Games, and playable in about an hour. Copycat is all about building up a political career. On your turn, you use your political minions to claim spaces on the board which provide you with abilities such as the ability to buy new cards for your deck from the available cards or to directly score victory points. The game is loaded with humor and political jokes, nodding to both recent German and American political history. 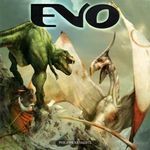 Evo is an area movement and auction bidding game for two to five players, designed by Philippe Keyaerts and published by Asmodee, and playable in about an hour. In Evo, you're attempting to evolve a species of primitive reptiles into the dominant species in the land. You do this by gradually adapting your creatures to the climate, engaging in some fights with other reptiles (where the strongest survives), and accumulating mutations that will make you stronger. The reptiles with the most mutations at the end of the game is the winner. Legend of the Five Rings is a collectible card game set in a fictional world based on Japanese fantasy. It's published by AEG, designed by a small team, and playable in about half an hour. In Legend of the Five Rings, you represent one of nine different clans vying for control of the land of Rokugan. The game generally revolves around players competing to destroy (or conquer) each other's provinces, which are represented by cards in play, and the game features nuanced and very flavorful gameplay. 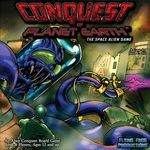 Conquest of Planet Earth is a fast-paced game with modular player powers, published by Flying Frog Games and designed by Jason Hill, and playable in about an hour. In Conquest, you play an alien race (of which there are ten in the base game) trying to conquer Earth - imagine a 1950s sci-fi alien invasion movie and you have the right flavor. The game offers four different game types - some competitive and some cooperative - but all share the same general goal of conquering Earth, which is represented by a modular board. Space Cadets is a real-time space exploration game for three to six players, designed by the Engelstein family and published by Stronghold Games, and playable in about ninety minutes or so. 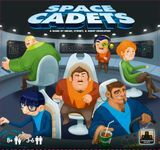 Space Cadets boils down to a series of cleverly-designed minigames that players must finish quickly in order to help the overall cooperative space exploration mission that the group is attempting to achieve. If you complete the mission, you win - if your team fails at enough of the minigames, you lose. It's a lot of cooperative fun.